Q: Why don't you have a method, your work would be easier to follow if you did? Q: Why are you so keen that people find their own way of working with their horses? Q: How long does it take to solve a problem like biting or loading? Q: I don't like to pay for things over the Internet is there another way I can get your e-books? Q: What is the most common cause of behavioural problems? Q: Is Clicker Training with equines much different from Clicker Training with dogs? Q: What sort of problems can you help with? Q: My horse does not have a problem, is their anything I can do to improve our relationship further? Q: What are the differences between training horses, donkeys and mules? Q: How long will I have to wait if I want a home visit? Q: I am interested in one of your workshops but you don't have any advertised how can I get on one? Q: I have already done some training with another behaviourist/trainer what makes you different, and can I combine two different approaches? Q: Why don't you advertise more widely? Methods are very good and easy to follow for humans, but I feel that sometimes the subtleties of the original trainer's skill can be lost in the translation of a method. This can lead to problems with owners that apply the wrong method to particular equine problem. I also do not believe "one size fits all" when it comes to equine training and because of the uniqueness of every equine human partnership I believe it is safer and better for the horse, donkey or mule if solutions are individual. That said, I do have a number of elements of training that apply to many situations, which are described in my e-books, The Horseman With - The Principles of Horsemanship and How to Write and Use a Shaping Plan. I also use a number of similar training procedures that help in a variety of training situations. I like to think of these as tools in a tool kit that I have at my disposal for use depending on the problem I am working with. If you have lots of different tools you are never stuck with a problem you cannot fix. Why are you so keen that people find their own way of working with their horses? 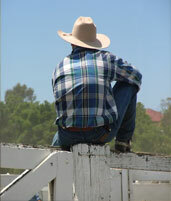 As each person finds their own path to horsemanship they make life long changes. Horses are the best teachers; trainers are only translators for the horse. I like the fact that we are all different and that we are all on different journeys of learning and discovery. I have seen too many people told to, just be more confident or to be the leader, when actually they were not ready for that step. As each person finds their own path to horsemanship they make life long changes that will benefit their horses, donkeys or mules. Our need to be individuals can be seen with many of the modern horse training practitioners. Having learnt the methods of another trainer or behaviourist, they soon develop their own methods to add to the original. Pretty soon the trainer splits from his or her mentor and sets up a new branch of the same tree. Every equine trainer and owner in the world trains differently, even if they have the same teacher. The horses are the smart ones, having to understand all these different methods of communication. Therefore, I start from this position and say take a little or take a lot the choice is yours. I don't say what you are doing already is wrong, but rather, can I help give you more insight in to equine behaviour and more ways to solve problems. How long does it take to solve a problem like biting or loading? The inevitable answer is it depends. During a home visit I can usually assess the situation and give a guide to how long it might take to change a behaviour depending on each individual situation. Simple behaviours may only take a few hours, provided the owner is able and prepared to keep up with new training practises. Many riding problems or established behaviours take three to six months to truly change, depending on the owner's skill, ability and commitment. The real work comes in maintaining the behaviour and the practise which the owner does after the problem is resolved. I don't like to pay for things over the Internet is there another way I can get your e-books? If you contact me via the contact page on this site then I can usually arrange a different form of payment and then either you can still receive the books in electronic format or for an additional cost, to cover printing and packaging, the books can be printed off and posted to you. What is the most common cause of behavioural problems? What are the most common behavioural problems? Pain and medical conditions, environmental restrictions, previous learning experiences, owner fear and lack of confidence, lack of understanding of the true nature of equines, not having a clear idea of what to do to solve a problem and not using shaping plans are the most common, but there are plenty more. Is Clicker Training with equines much different from Clicker Training with dogs? I believe it is different enough that people who are experienced with dog Clicker Training still need to study equine Clicker Training and vice a versa. A few differences include the problem solving ability of equines compared to dogs, the speed of activity and potential for equines to injure the trainer. It is a good idea to teach equines to be patient during Clicker Training as this helps later in training with building longer duration behaviours and with avoiding frustration as the clicker and reward are phased out. Equines must also learn when Clicker Training is available, the use of a bum bag or different waist coat for food rewards is important. The science is the same in both species, but I have found an equine's motivations and behaviour require a different practical application of Clicker Training compared to Clicker Training in canines. What sort of problems can you help with? As the work I do is based on the application of the science of behaviour I can generally help whenever behaviour change or improvement is required. Whenever an owner needs to learn more about the changing of behaviour or about creating new behaviours I can help. However, in order to proceed, pain, medical conditions, tack and environmental conditions must all be ruled out as a cause of behaviour change, before beginning any training. My horse does not have a problem, is their anything I can do to improve our relationship further? The science of behaviour is not just useful to those owners who have a problem with their equine. Anyone who wants to understand their animal more will benefit from understanding the science of behaviour and learning. If you want to train new behaviours such as preparing for future events such as loading, competition, show or preparation of young horses and foals for their life in domestication using the Principles of Horsemanship can help. Simply by understanding how to shape behaviour, safely stretch comfort zones and develop trust, you can improve the relationship between you and your horse. Rather than wait for a problem to occur some people have a home visit with their new or young horse just to ensure they create a good shaping and training plan for their horse's development. This preventative training helps to ensure a happier and safer relationship between them and their horse. Simply by understanding your own behaviour better you will better understand your horse and this will improve your relationship further. What are the differences between training horses, donkeys and mules? They say, you can tell a horse what to do, but have to ask a donkey. They say, you can tell a horse what to do, but have to ask a donkey and negotiate with a mule. I work on the basis that if you negotiate with all three you get happier animals and safer training. Anyone who says a mule is stubborn has just been out smarted by one. Some people hate working with mules and donkeys as they tend to have less of a flight mechanism and although mules tend to be more sceptical and require more trust in the handler before committing themselves. I love working with mules and donkeys as well as horses, they all have huge potential given the correct training. If you can train a horse, you can train a horse; if you can train a mule you can train anything. Understanding bonding and the effects of stress is also vitally important for anyone training a donkey. How long will I have to wait if I want a home visit? This depends on two things, firstly, your location in the U.K. if I have other visits in your area it is better financially for you if I combine them, so you may prefer to wait for a prearranged date. Secondly it depends on the dates that are still available in my diary. The wait can be up to 8 weeks in some cases. Obviously I will try to fit in with individual requirements and situations wherever possible. I am interested in one of your workshops but you don't have any advertised how can I get on one? Simply send me your details, either your email or postal address and let me know where you live, what you are interested in and how far you are prepared to travel and I will contact you when there are opportunities you may be interested in. In time there will be a diary page on the website where all this information will be available. I have already done some training with another behaviourist/trainer what makes you different from other trainers, and can I combine two different approaches? I believe that training equines is a balance of art and science, knowing the science is good, but being able to apply it and explain it practically is a different matter. Firstly the differences are I don't have a method and I'm not a behaviourist; I am simply an equine trainer that uses the science of behaviour and learning. I believe that training equines is a balance of art and science, knowing the science is good, but being able to apply it and explain it practically is a different matter. There are also good trainers who can do the job but can't teach you how to do what they do. My skills lie in the practical application of the science, I don't just tell clients what they should do, I explain it, I show them and then I help them to learn to do it as well. I believe each person is an individual and therefore each training session is different. Allowing people to learn and develop their own skills with their own animals is more important to me than showing people what I can do. Why don't you advertise more widely? I believe you cannot force people to learn and to truly benefit from my work people have to want it. People have to want to learn, change and expand their comfort zones. Advertising might bring lots of customers attracted to the idea of change, but word of mouth and allows people to choose and be ready to commit to the hard work it takes to develop a real relationship with their equine. When I started Hart's Horsemanship I wanted to remain ethical and not sell out the horse or my beliefs for the quick income or to the demand of the quick fix enthusiast. The old saying goes, "a man convinced against his will, is of the same opinion still."